The above products are recommended for installation or mounting of the Stainless Steel Handrail Bracket - VR453. The VR453 Modern Stainless Steel Handrail Bracket is the perfect compliment to our cable railing offering. The brushed finished, and modern design make it a must have for any wall mounted handrails. Projects from the wall is 3 1/2″. Available in any of our powder coating finish options. Ships unassembled for easy installation, included necessary screws for both wood & metal handrail installation. At least 2 of the 4 wall mount screws must be mounted into a stud. IBC requires compliance with 50 lb. per lineal foot support. Any data on allowed supported loading per bracket (in other words, how many brackets are required for a given handrail system)? Thank you for your question, Jim. We suggest placement of a handrail bracket at intervals no more than 48″ apart. Alex, It appears we may have made an error in our previous answer to Jim. We have corrected the answer to read “no MORE than 48″ apart”. We apologize for the confusion this typographical error may have caused. Can this be mounted to dry wall? We strongly recommend that you install 2 of the screws into a stud. However, if that’s not possible you could probably find a drywall anchor that is strong enough to support the handrail. You’d want to check the specifications of the anchor before relying on it. Thank you for your question, Phil. The holes are spaced at 1 1/4″. What is the difference between a “flat bracket” and a “rounded bracket”? Thanks for contacting us. 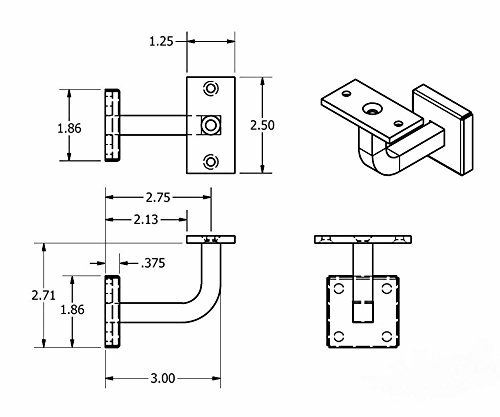 The flat bracket is what is pictured on this page. The rounded bracket is bent to accept a round handrail. Shown here, appears to have a rounded wall mount, using only one screw. Can be installed on basic 1″ x 2″ metal rail. Does the bracket allow for the rails to be sloped down/up for stairs? Yes! This bracket is often used for stair handrails. 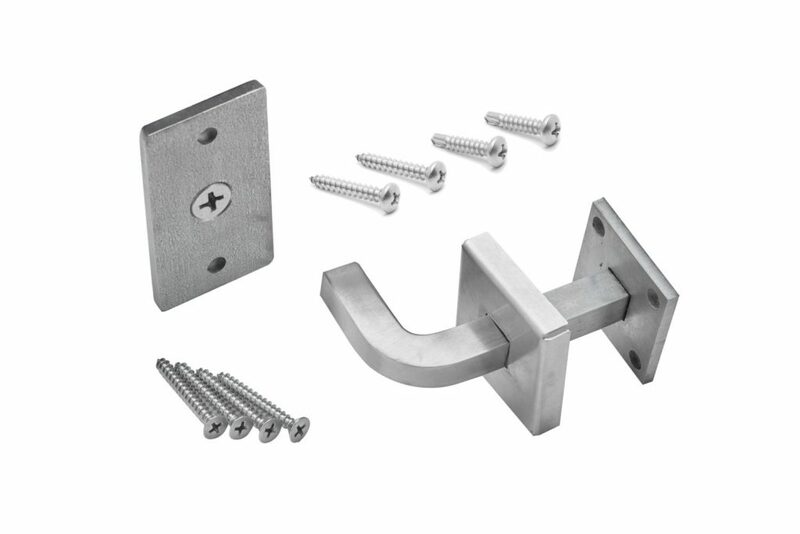 The mounting plate for this bracket has 4 holes, but only 2 must have screws that mount to a stud for a secure fit. This allows you to turn the plate to accommodate the angle of your stairs. Let us know if there’s anything else we can help with! The wall thickness is .375″ and the height and width is 1.86″. We’ve recently uploaded the full dimensions to the photo gallery on this page as well. Can the top piece be rotated, so this can be used as the ending connection of a rail to a wall? If you’re looking to terminate your handrail at a wall, we would recommend you purchase a Post Side Handrail Bracket. 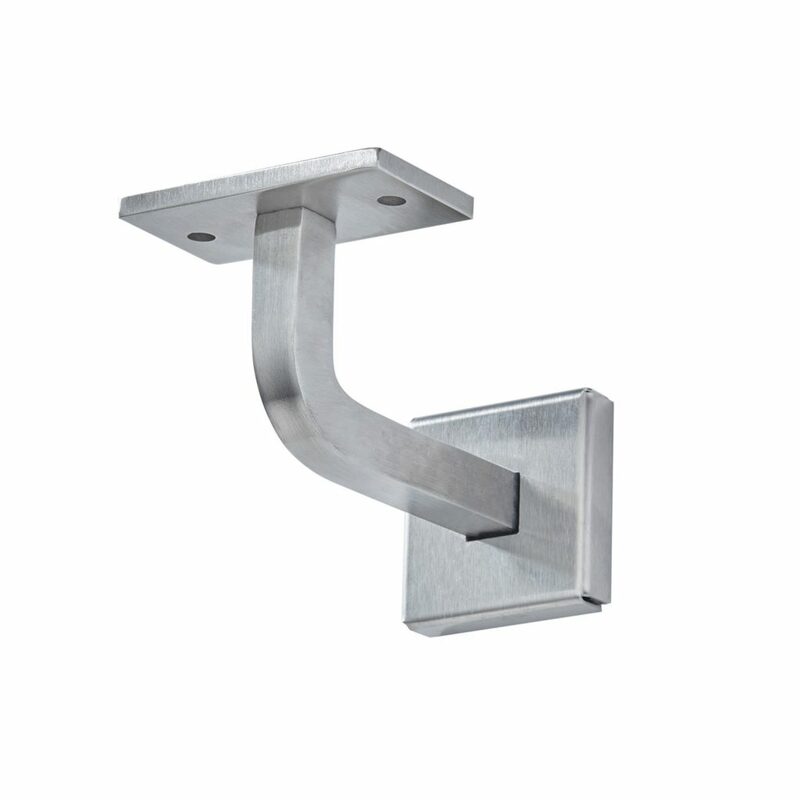 This bracket allows you to terminate your handrail up against a surface like a post or a wall. For wall-mounting, we’d recommend you use the Wood Post Mount option. If you have additional questions, give us a call at 1 (866) 226-6536. Does your company produce these brackets? Is it possible to special order the VR453 brackets with no wall screw-cover plate and at 3.75 inches depth instead of your standard 3 inches depth? See your product illustration. To ensure the accuracy of your custom order, we’d recommend giving our team a call at 1 (866) 226-6536. We’ll get you in touch with one of our experts who can customize your brackets. HI CAN YOU TELL ME PLEASE WHAT BEST BRACKETS FOR HAND RAIL 6710 PLEASE? Thanks for the question alcruz68.